PhD students and post doctors were chosen to take part in seminars and the MWP symposium following the ceremony of The Marcus Wallenberg Prize. The 2015 Prize is awarded to Professor Akira Isogai and Dr Tsuguyuki Saito, The Univerisity of Tokyo, and Dr Yoshiharu Nishiyama at the research institute CERMAV, Grenoble, France. They have developed an energy-efficient method to produce nanofibrillated cellulose. Stabilizers in chemicals, food and cosmetics, raw materials for new types of textile fibres or composites or materials for wound dressing are just a few examples of the wide field of possible applications. 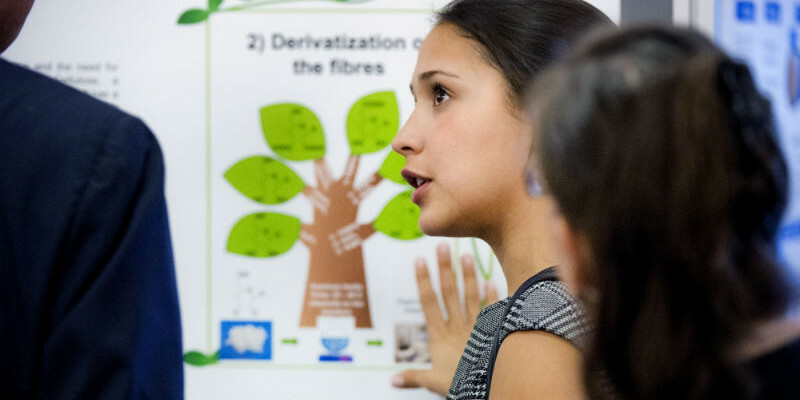 The young researchers applying to the celebrations and seminars had to reflect on how their results can influence both the forest industry and the society. They were also supposed to suggest applications to business development. The Wallenberg Foundation selected 19 participants from Swedish universities/institutions. A jury in each country chose 11 young researchers from Finland, four from Canada and two from Japan. Several applications focused on environmental advantages of wood based materials. Many projects analyse different kinds of cellulose, replacing fossil based products. One of the researchers investigates the possibility of using nanocellulose to absorb heavy metals from water, another tries to develop textile fibres with better properties than rayon and other materials of cellulose. A couple of projects use genetic engineering to develop trees producing more biomass. One project challenges the competition from concrete and steel in the building trade by developing an innovative design for large timber structures suitable for industrialized construction methods. Another develops a wood fibre to isolate electric cables. Professor Gunilla Jönson, chairperson of the Selection Committee, certifies that many young researchers are engaged in the development of one of the most important raw materials in the world. – They have new ideas and hypothesises that can contribute actively to a more sustainable society, she says. Several of the research projects would not have been carried through without the support from different companies. – New possibilities can be created and realized when the academy and industry meet and listen to each other, says Gunilla Jönson. According to Professor Kaj Rosén, Executive Secretary of The Marcus Wallenberg Foundation, the purpose with the symposium and poster session is to give young researchers a chance to show their results to the forest industry. – They also get a chance to discuss with the laureates and established scientists from all over the world, he says. The Marcus Wallenberg Prize of SEK 2 million is awarded once a year to encourage and stimulate path breaking scientific breakthroughs, contributing to increase the technical development for the forest industry. The young researchers’ abstracts are published here.